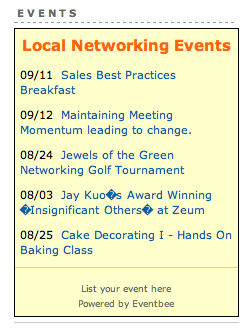 Eventbee an event management startup out of Sunnyvale, CA has been a busy little bee lately. They are rumoured to be launching two Facebook apps (one for event registration and one for event recommendation) in the next week or so (who isn’t?). They are also developing a channel on Ustream.tv to cover local events. The company provides a great package of event management tools including online registration, email marketing (souped-up spam) and online event promotion. Their online event promotion tools include a nifty service called Event Network Listing that can only be described as “AdSense for events.” The service lets event planners for a fee list an event on any site or blog in Eventbee’s growing partner network. The partner network consists of sites and blogs that have AdSense-like code embedded on their sites. This allows for highly targeted and controlled event promotion. You can see Eventbee’s network event listings in action on Rajesh Setty’s LifeBeyondCode. Eventbee partners get paid in two ways. First, they get an initial listing fee for each new listing that they get to set in advance. Second, when event ticket purchases are initiated from their site they receive a commission. The commission amount is set in advance by the event planner. Eventbee keeps 29% of the total earnings partners make. Event planners can create customizable event pages on Eventbee’s site just like you can with Eventbrite (see our Eventbrite TC20 page here). Tickets sold from event pages start with fees as low as 1.45% of ticket price, plus a minimum fee of $0.25. RegOnline and Acteva also offer online event registration. Eventbee’s glorified spam, I mean, email marketing service is tightly integrated with their online registration. You can create beautifully designed emails by importing HTML code or using their WYSIWYG editor. The service allows you to track bounced emails, opened emails and online registration URL click-throughs. They currently have over 6,000 event managers. They are self-funded with CEO Bala Musrif claiming to be profitable since 2005 with no plans for raising money.